I hope everyone had a good weekend. Can you believe that it is the 15th of the month and we are half way through June already!! Wow!! The 15th also means it's monthly challenge time over at Whimsie Doodles. Our theme for June is summer fun, I hope you can join along. 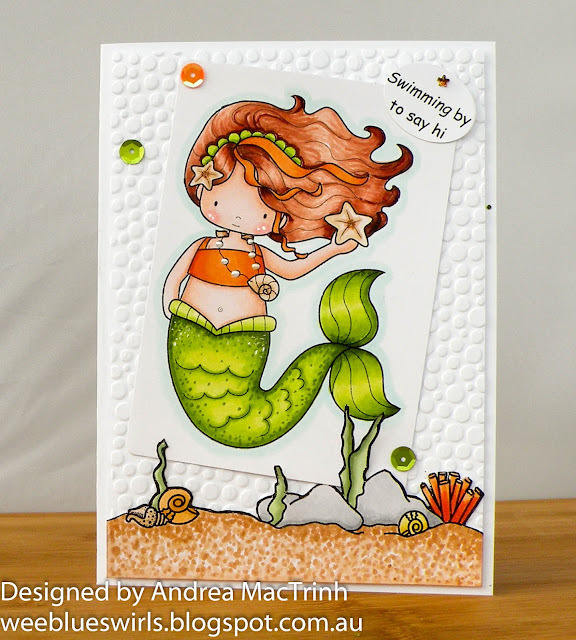 For my card I used Starfish Mermaid digi, I love this image and have been wanting to colour her up for ages, so was glad to finally get the chance. I paired her up with one of the awesome Beach Borders. I coloured her with my copics, added some liquid pearls to her necklace and wink of stella to tail, but it doesn't really show up in the photo. Thanks for visiting, I'm hoping my crafting mojo returns soon. What a cute card. Love her! Thanks for sharing with us at Crafty Catz this week.